Modern day air travel comes with a grab bag of headaches, though one of the more obnoxious is getting stuck on the tarmac, captive in your tiny seat, waiting out rough crosswinds or runway gridlock caused by a pileup of random delays. That's why we're so pumped about this new circular "Endless Runway" concept, which would allow for planes to take off and land in all directions, streamlining the whole process, and getting you wherever you're headed faster. 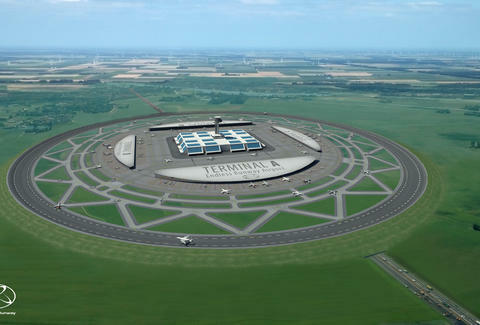 The brainchild of Dutch scientist Henk Hesselink, the Endless Runway concept involves one continuous circular, banked runway -- roughly 2.1 miles in diameter -- surrounding one central terminal hub. The brilliant notion behind it is, rather than having to redirect or pause lineups of planes on conventional runways due to perpetually shifting wind conditions (often the cause of delays), a circular version would enable aircraft to take off and land at whatever point the wind is most optimal. Additionally, it would allow for up to three planes to take off or land at the same time -- mercifully stepping up the pace of departures and arrivals. Beyond making it more efficient for planes to get on and off the ground, a circular runway would also reduce the geographic footprint of airports, which should be attractive to already-cramped metropolitan areas in need of better -- or more -- airport options. 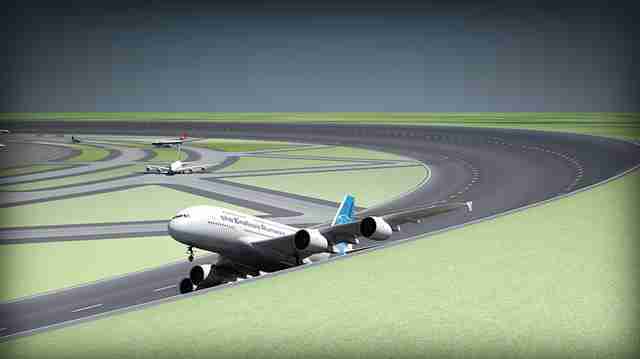 Hesselink also predicts that employing a circular runway would cut down on damaging aircraft fuel emissions in the aggregate, since planes wouldn't need to fight strong crosswinds as much. There's no official timeline to test out the concept at the moment, but several European aerospace centers have thrown their support behind it, so you may soon have the chance to find out what it's like to take off in a whole new way. Joe McGauley is a senior writer for Thrillist. Follow him to flight delay-free utopia @jwmcgauley.